WEDNESDAY, Feb. 1, 2017 (HealthDay News) -- A common soccer move -- bouncing the ball off of the head -- may not be as harmless to the brain as has been thought, new research suggests. 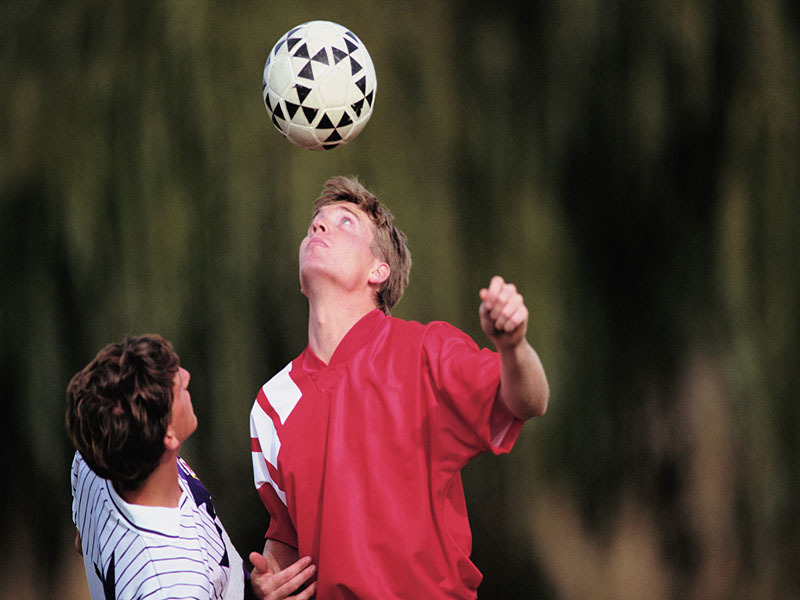 A study of more than 200 adult amateur soccer players of both genders found that regularly "heading" the ball, as well as suffering accidental hits to the head, significantly boosted a player's risk of concussion. "The prevailing wisdom is that routine heading in soccer is innocuous and we need only worry about players when they have unintentional head collisions," study leader Dr. Michael Lipton, of the Albert Einstein College of Medicine in New York City, said in a college news release. "But our study suggests that you don't need an overt collision to warrant this type of concern," said Lipton. He is professor of radiology, psychiatry and behavioral sciences at Einstein. Another concussion expert who reviewed the findings agreed. The study "seems to provide additional evidence that such practices within the game of soccer can put athletes at risk for traumatic brain injury," said Dr. Jamie Ullman. She directs neurotrauma at North Shore University Hospital in Manhasset, N.Y.
Much of the research into sports-related concussions has concentrated on high-impact sports, such as football or hockey. But head trauma experts have long known that other sports -- including soccer and rugby -- might carry risks, too. In prior studies, Lipton said his team found that "30 percent of soccer players who'd had more than 1,000 headings per year had a higher risk of microstructural changes in the brain's white matter, typical of traumatic brain injury, and worse cognitive performance." Exploring the issue further, the new study focused on online questionnaires answered by 222 adult amateur soccer club players in the New York City area, both male and female. All had played soccer at least six months during the prior year. Men averaged 44 headers in two weeks, the survey found, while women averaged 27. One or more accidental head impacts, such as a ball hitting the back of the head or a head colliding with another player's knee, were reported by 43 percent of women and 37 percent of men. Players who regularly headed the ball were three times more likely to have concussion symptoms than those who didn't head the ball often, Lipton's team reported. Players who suffered accidental head impacts two or more times within a two-week span were six times more likely to have concussion symptoms than those without accidental head impacts, the findings showed. Of those who headed the ball or reported accidental head impacts, 20 percent had moderate to severe concussion symptoms, according to the report. Of the seven players with very severe symptoms, six had two or more unintentional head impacts over two weeks, four were among those who headed the ball the most, and three were in the group that headed the ball second-most. Lipton stressed that the findings cannot be generalized to child, teen or professional soccer players. Still, "our findings certainly indicate that heading is more than just a 'sub-concussive' impact, and that heading-related concussions are common," Lipton said. "We need to give people who have these injuries proper care and make efforts to prevent multiple head impacts, which are particularly dangerous." That means watching out for symptoms, he added. "Many players who head the ball frequently are experiencing classic concussion symptoms -- such as headache, confusion and dizziness -- during games and practice, even though they are not actually diagnosed with concussion," Lipton explained. "Concussion sufferers should avoid additional collisions or head impacts during the following days or weeks, when their risk of incurring a second concussion is extremely high," he said. "Because these injuries go unrecognized and unmanaged, there may be important clinical consequences for the short and long term." Dr. Salman Azhar is a neurologist and director of stroke services at Lenox Hill Hospital in New York City. He said the new findings are in accordance with prior studies, and the odds for concussion appeared to rise along with the frequency of head impacts. "The chance of having moderate-to-severe symptoms increased when the unintentional heading went from just one per two-week period to two per two-week period," Azhar noted. The study was published online Feb. 1 in the journal Neurology.